Delilah traveled to Haiti with the U.S. military and UNICEF. She saw there that the hospitals didn't have incubators and many babies, especially pre-mature babies, had no way to stay warm, except to be held flesh-to-flesh against their mothers (in a "kangaroo pouch" hold). But she also saw that most of the babies didn't have baby beanies (caps) to retain the heat their mothers were helping them to generate. That was all it took, the "Beanies 4 Babies" project was born! And Delilah's listeners and Point Hope donors were very quick to be generous with their skills and their time and their funds. They all created beautiful and useful beanies and mailed them to Point Hope and then we delivered them--some to Haiti and a whole lot more to Ghana, where mamas and their little, fragile bundles of joy gratefully received them! And then they sent in blankets and booties and sewed dresses and shirts and shorts...in fact, their crafts of all sorts benefitted children of all ages. 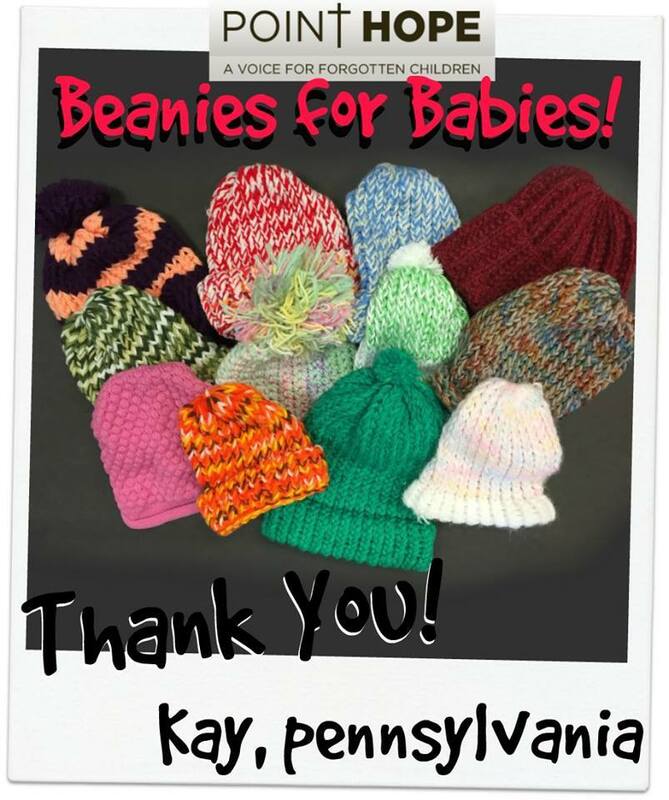 So, although we still call the project, "Beanies 4 Babies", some very caring and compassionate people decided that they would not be limited to hats. Maybe we should call it "Clothing 4 Kids"! But no matter what the project is called, hundreds of at risk children receive help and hope. Join Point Hope in being one person who makes a difference, who is a voice for the forgotten children, who cares! Thank you and keep them coming, you are ALL Heros! ARE YOU A POINT OF HOPE? Register with Point Hope to let us know we will be hearing from you! Become a partner in Hope! What are you passionate about, what talents do you want to share with Point Hope and our kids? What else would you like Point Hope to know about you? What else would you like to do for Point Hope? Come be blessed!! 100% of your donations go directly to help people and support the operations of Point Hope. I have made it my responsibility to cover all administrative fees, so you will know your investment in humanity stretches as far as possible.